Learning to take better care of ourselves in difficult times. Let’s face it, we’ve all had times in our lives when we felt like we were living in a fog. I’ve actually had clients come in and describe their state of mind as being foggy or fuzzy-in-the-head. Some clients come in and tell me they have so much going on in their lives that they can’t see straight. We all know what it’s like to drive our cars through thick fog — it can be very unnerving and if we don’t take the necessary precautions, fog can be a dangerous condition. Any new driver who is learning the basics around safety and road conditions knows that when driving in fog, the following rules are very necessary to put into place. Slow down: First and foremost, and usually quite instinctively, we know that we need to slow down. Makes perfect sense, right? If we can’t see 5 feet in front of our hood ornament, we slow down, period. Stay focused and avoid distractions: We may not even realize we are doing it but we keep our distractions like phone calls and loud music to a minimum when the fog is as thick as pea soup. We subconsciously know that we need to keep our attention on the matter at hand which is to get through the fog safely. Use fog lights, not high-beams: Lights on the ground are important when driving in dense fog because we don’t want our high beams reflecting off the fog and back at us. Pull over if there is no visibility: If the fog gets too heavy, we know we need to pull off to the shoulder or get off the road until the fog lifts. We all know exactly what we would do if we were cruising down the highway at 70 miles an hour only to find ourselves driving into a really bad patch of fog. We would move into caution mode. We’d slow down, tell our friend on our car Bluetooth that we’ll call him back in a few minutes, turn on our fog lights and move towards the slow lane just in case we need to pull over. Then, once the conditions were clear again, we’d increase our speed and give the song on the radio a little more volume. No-brainer, right? When the conditions are physical, we get it. When the conditions are energetic, most of us don’t get it in quite the same way. Extreme circumstances present themselves like loosing a loved one, loosing a job, going through a divorce or having an unplanned pregnancy. Ignoring a nagging feeling inside when we know we are supposed to be doing something while having little or no time or energy to pursue it or complete it. Trying to do too much or please too many people while inevitably putting ourselves last. There is simply too much going on in life and not enough resources to manage it all. 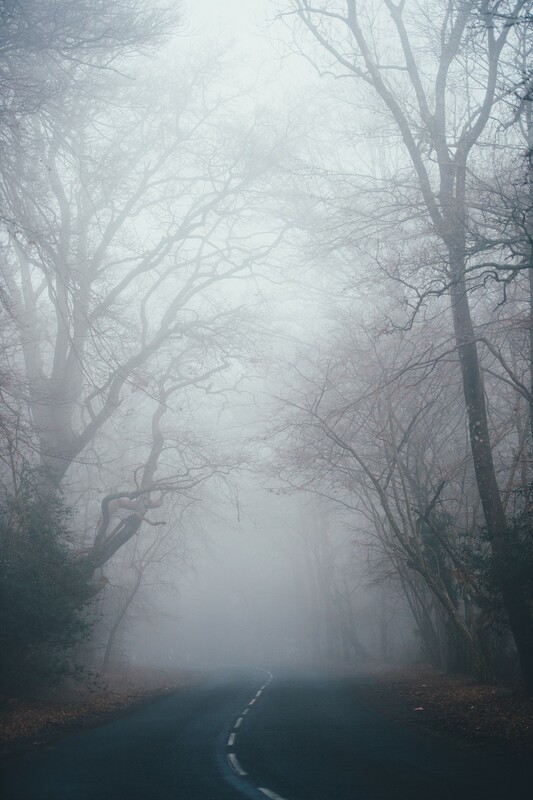 Energetic fog can make us feel unclear, heavy and often times overwhelmed — very much like actual fog. Regardless of why the fog has arrived, the first step is to acknowledge that it exists, just like we would if we were physically driving into a fog bank. Once we are aware of it, we can move into caution mode to make sure we are driving through our energetic fog safely. Slow down: Most of us hit energetic fog but don’t slow down, like, at all. We still do everything we normally do (school, work, chores, errands) and don’t think twice about piling on a whole lot of extra to-dos. “Oh, you need me to do triple carpool duty this week? Sure, why not?” “Oh, you want to do a fun fixer-upper project that will utilize every weekend for a month? Sure, what the hell?” Learning to say no to the extras during foggy times is like taking our speed down from 70 mph to 25 mph. It’s a really good idea. Once we are through the fog safely, then we can add the extras back in. When in the fog, we need to take better care of ourselves, slow down and not heap on the extra responsibilities or commitments, even if they are by all accounts what we would consider fun commitments in normal conditions. SLOW DOWN! Stay focused and avoid distractions: When energetic fog gets really thick, we need to stay focused on the task at hand which is getting through the condition or situation safely. And by safely, I mean keeping our minds, bodies and souls as healthy and intact as we can. For this reason it’s probably not the best time to let the alcohol poor too freely. For many, drinking will be an involuntary reaction because the idea of dulling the senses during foggy, stressful times feels like the right thing to do to take a break. But we wouldn’t take a shot of tequila while driving on a foggy highway so let’s reconsider overdoing the alcohol when driving through an energetic fog bank. Drinking too much moves us away from clarity and focus. Driving through energetic fog can also cause us to want to distract ourselves with things like other people’s drama or piling on extra responsibilities to take our mind off our own fog. Neither of these are helpful in our pursuit of staying focused. Lights on the ground: Keeping our energetic lights (our focus) on the ground is especially necessary when driving through energetic fog, and very much complements the second bullet of not allowing ourselves to get too distracted. Keeping our heads down allows us to not have our vision pulled into unnecessary directions. It’s very much like being in that survival state of fight or flight mode when we move into an automatic state of focused attention better known as tunnel vision — one of nature’s clever defense mechanisms allowing us a better chance of surviving by keeping our head in the game, or, our energetic lights on the ground. There are some wonderful exercises we can do to help us keep our lights on the ground like remembering to breath deeply throughout the day, meditate — even if only for 5 minutes, and take a nice walk outside with the intention that we are going to be present on the walk — notice the trees, the air and the way the flowers smell. Pull over if there is little to no visibility: In those extreme cases where the fog is so thick that we just can’t see, we need to give ourselves permission to pull over. That might look like calling in sick or taking a leave of absence while promising to be kind to ourselves, not to heap on more unnecessary stuff. It might look like going to bed incredibly early several nights in a row or just saying no to everything and everyone except the bare-minimum. Maybe it’s taking some time off to pursue the urgings of the heart. If we can learn to respect the fact that life will sometimes present us with patches of thick fog, we can learn to give ourselves a break and navigate these times using not only these safety tips but also a little self forgiveness. We don’t need to always drive our cars at 75mph. We don’t always need to say yes to all the extras. When the sun is out and the conditions are perfect, great, have at it — enjoy the exhilarating ride. But when the fog rolls in, we need to honor these times as well. We can allow ourselves to slow our roll, take it down a notch and focus on getting through the fog safely so that we can enjoy the sun once it breaks again.